Heller’s AMX-30 series of tanks and derivatives has been around a while. They’re still reasonable kits, although they’re far off the modern standard and not entirely accurate, especially the GCT / AuF1 self-propelled gun. But, as the saying goes, they’re the only game in town. Even if you don’t mind an old-fashioned kit, one look inside the box will reveal what’s commonly agreed to be its worst feature: its tracks. They’re really quite horrible. The vinyl is stiff and they’re slightly too long, so it’s impossible to get that characteristic dead-track drape over the return rollers. In fact they remind you of old Esci 1/72 tracks - determined to adopt a circular shape no matter what, very much at the expense of any convincing effect. On top of this, they’re effectively a hollow mould. The outer face is reasonably good, albeit without any trace of link pins; but the inner face is just the back of that in reverse relief, so that what should be the back of the pin is a little channel instead. A number of upgrades for these kits is available, although supply is intermittent. Most come from Phebus in France, who will do you a very nice AMX-30B2 conversion, and also offer two patterns of track in resin. Unfortunately their website hasn’t been updated since January and the “Military” page is even older than that, so I can’t confirm whether those two patterns are the original and the Diehl replacements, although that would make sense. Another source, unsurprisingly, is Friulmodel. And now Heller themselves have entered the fray with this new set. That Heller exists at all is a bit of a surprise. They reappeared a couple of months ago (summer 2012), bringing a batch of old and treasured kits back onto the market, the AMXs among them. And alongside that is a new set of replacement tracks in injection-moulded plastic. Credit to them for recognising how desperately better tracks were needed, although it might have been better if they’d included them in the tank kits. Still, if you have an older kit and want only the tracks, a separate set is nice to have. The set and the packaging couldn’t be simpler. Behind a neat illustration derived from the one on the AMX-30/105 box are five sprues of silvery plastic reminiscent of old Monogram material. The instructions are on the back. That’s it! Each link is in two parts, inner and outer faces, and you get enough for 220 links in all. Given that the original tracks are 84 links per side (168 overall), that’s a lot of spares. You even wonder if there should be only four sprues. The outer face is attached to the sprue by a single gate; the inner face by two. If you’ve ever mucked around with AFV Club tracks, this is a boon. On the other hand the sprue gates are coarse, so care is needed; but the plastic is soft without being unduly flexible, so removing them and cleaning them up is quick and easy. Assembly is fairly straightforward, especially compared with Friul tracks. You take an outer face, which has half-round sections to hold the pins along one side. The inner face has the full-width pin along one side and the other set of half-round sections along the other side. You drop the pin into the matching bit of the outer face, which gives you two half-links side by side. Then you take another inner face and glue it onto the outer face so that it closes around the pin. That’s one and a half links to start you off, and assembly proceeds from there with alternate outer and inner faces. It’s not completely clear what you do to close up the loop, but it should go OK. Fit is very positive - with a little pressure the links will hold together dry, and there are tiny pips to prevent the links pulling apart from each other. However, they wouldn’t take any handling in this state, and glue is essential. With care and very sparing application of glue it’s possible to make a set of nice solid links that will still articulate fully and allow you to fit them easily. Comparison with photographs shows that the design is fairly accurate but a little light on detail. The representation of the pins is a huge advance over the kit tracks, although the hollow ends are missing, and you’ll need to take care over them because each end of each pin is split between the inner and outer faces and so has a gap that needs closing. This will be a challenge if you’re to keep them workable. The bolts that connect inner and outer faces on the real thing act as location pins and have a good hexagonal profile, much better than the kit’s. The top of each guide horn has a curious little projection on it that looks just like an ejector pin tower. The real thing does have a pin on top of the guide horn, but it’s finer and tapered, so we have to conclude that this actually IS a pin tower. Oddly enough this is represented better on the kit tracks. I suppose you could drive yourself mad by cutting off vinyl guide horns and gluing them to plastic tracks, or sanding the pins to a more accurate profile. Or you might feel life’s too short for that - after all, the difference isn’t that great. Each inner face has prominent sink marks between the bolts; each outer face has another behind the guide horn. Luckily these are on the mating surfaces and won’t be seen. The inner faces, though, also have tiny sink marks on the backs of the pins, and these remain visible. They’re not awful but a purist would want to sort them out. All dimensions are the same. Friul’s are heavier and will sag more readily. Heller’s can be made to sag, of course, if you glue them to the return rollers. Compared with Friul’s, the rubber blocks on Heller’s are slightly too small (worse) but deeper (better). The little dished sections at the outer ends of the links are better on Friul’s - deeper and with a representation of the curious little peg on the real thing. Friul gives you hollow pin ends and better guide horns. Heller’s bolts are better - the right size, and better defined. Overall, I’d say that it was a draw. I’m happy to have one set of each. Highs: A much-needed improvement at an OK price; some good detail elements; straightforward assembly; masses of spares! Lows: Not all details as good as they could be; far too many pin marks; awkward sprue gates. Verdict: Heller’s track set retails at £12.99. This is a little steep for what you get, but it’s in line with the firm’s general pricing. And they’re much easier to find than the Phebus alternative. Worth getting. Thank you, Sean for providing this product review. 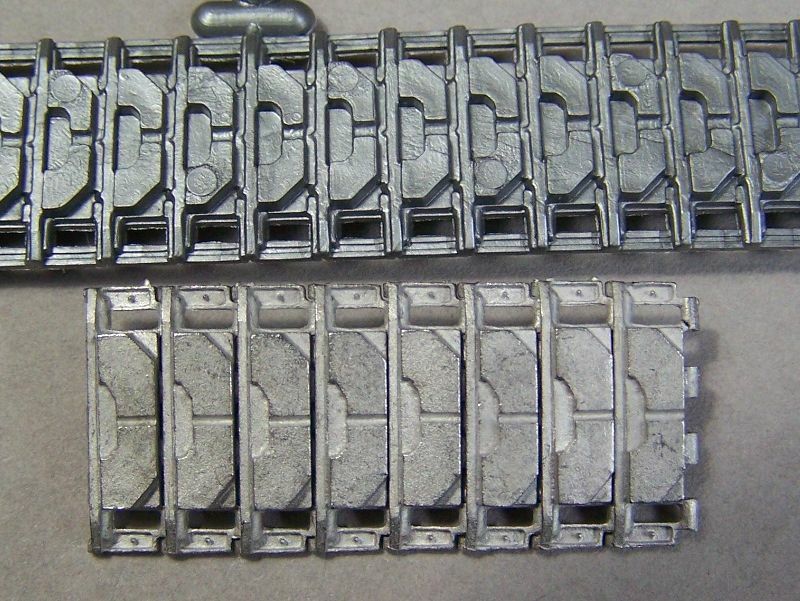 I wonder if Heller will do the same and create Link-and-Length replacement tracks for their 1/72 AMX-30 kit? Probably not for the amount they would likely charge. Really? Sorry about that, I had absolutely no idea. On the bar, you're right, but with luck it won't matter too much. The bar is actually a guard for the link pin, so one sits just about directly above each pin. The way the Heller tracks go together has this effect. The bar is in fact connected to the link as you say, across the wider part of the chevron, but the difference is very small in 1/35. I promise not to look if you won't either.